Whenever I find my mind spinning around, thinking about too many things at once, my go-to solution is to get outside and start walking. Walking helps me clear my mind of cobwebs and clogged up thoughts. Walking is good for getting rid of swirling, twirling thoughts that seem to endlessly fly around with no direction in sight. Walking also gives me a sense of accomplishing something…if only to exercise my needy body! As I walked in the chilly outdoors yesterday (it is April right? ), I let my mind wander while taking in the much needed change of scenery, trying my best to get into a healthier frame of mind. I had recently heard a news report on the radio stating that thinking about certain kinds of words can make you feel better. The report found that when walking or doing other kinds of exercise, some people like to make mental lists of various things in their lives. I thought I would give it a try. I began to think about positive words that might help me turn my mood around. Comforting words that bring about an emotional boost. Tranquility is a good word. Just saying the word tranquility makes me think of an azure blue body of warm water, calm and smooth. I imagined myself floating on this beautiful body of water with not a care in the world. Illuminate is another word that makes me feel calm. When I think of illuminate, I think of candles in a church, flickering inside their deep blue and red glass containers offering hope to all who see them. Inspiring is another word that I like. When I say the word inspiring, I feel as though I am mentally flying through a sky full of fluffy clouds weightless and free. I think I had walked about a mile at that point and I felt so much better. 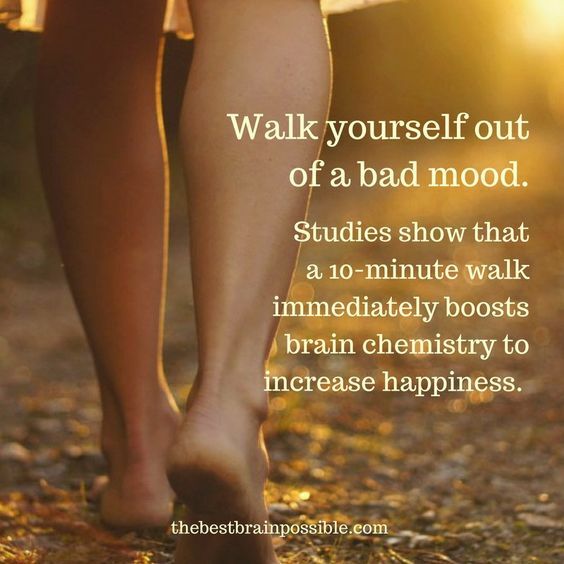 Walking seems as though it is a simple act, and it is, but it’s also an opportunity for you to keep your mind and your body moving forward. Step by step. Word by word. A good walk can do wonders for your well being. With that in mind, how about the word support? It’s a good old meat and potatoes word that sounds exactly like what it does. It’s a practical word indicating that some kind of comfort or assistance is being offered. Everyone can use a little support whether we want to admit it or not. Support can be a friendly smile or an unexpected phone call. When I think about being given support, I feel as though someone who cares about me has wrapped a cozy warm blanket around me. Mmmmm…. Support can be holding someone in your heart and saying a quick prayer of protection for them. We all need to know that there are people who have our backs, in times of trouble and times of abundance. I’m telling you my friends, going for a walk does the trick. You’ve done it once again, Mary Kate. Thanks for the great words. You’ve done it once again too Debbie. Thanks for making may day and reading my posts! Thanks, Mary Kate! Walking is such a simple thing, yet we forget about its benefits. You’ve reminded us! Hi Jean! Thanks for the positive feedback!